“The Healing Connection: Heaven's Health Care Plan” from Christian Faith Publishing author Brad H. Spencer reveals the connection between health and spiritual wellbeing. The ability to heal is only possible when it is the will of God. 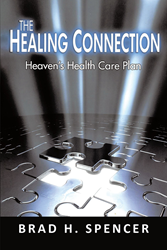 “The Healing Connection: Heaven's Health Care Plan” is the creation of published author, Brad H. Spencer. In 1981, Pastor Brad H. Spencer graduated from Rhema Bible Training Center in Tulsa, Oklahoma. He has spearheaded healing and miracle crusades around the world. Brad has been the senior pastor of His Image Ministries for the past twenty-eight years. For more information concerning the ministry and teachings of Pastor Brad H. Spencer, please visit https://www.hisimageministries.faith or email him at healingspringsintl.faith(at)gmail(dot)com. Published by Christian Faith Publishing, Brad H. Spencer’s new book reveals the connection between health and faith. “The Healing Connection” is not just a book. It is a ministry tool. The concepts in this book will, and already have, helped readers make a connection to the promise of healing in the New Covenant. It challenges traditional teachings concerning healing. It also explores whether or not it is God’s will for the affirm to be healed. From cancer to arthritis and so much more, author Brad H. Spencer has received countless testimonies from people who made the connection and were healed. This book teaches readers how to receive the miracle of healing miracle as well as how to keep it. View a synopsis of “The Healing Connection: Heaven's Health Care Plan” on YouTube. Consumers can purchase“The Healing Connection: Heaven's Health Care Plan” at traditional brick & mortar bookstores, or online at Amazon.com, Apple iTunes store, Kobo or Barnes and Noble. For additional information or inquiries about “The Healing Connection: Heaven's Health Care Plan”, contact the Christian Faith Publishing media department at 866-554-0919.